The MRS Nomad S1 I tested last summer in Scotland is my new packraft. Goodbye to my great little Alpacka Yak. Like the Yak before, it held its value and I sure got my money’s worth out of it over 4 years.. The Nomad is an unusually long packraft with a central seat, making it more of a packyak which paddles much like a short IK (barely yaws), has more space and weighs under 5kg with a roll-back skirt and thigh braces. So – easy to walk with for as long as you like. 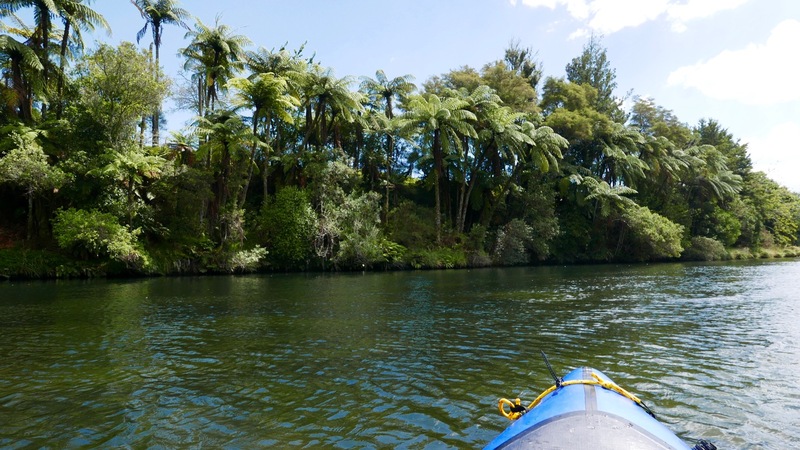 I’d originally planned the classic North Island paddle: the canoe-able and therefore safely packraftable Whanganui River in the southwest. The best section is a 5- or 3-day-with-huts run for which you need to be self-sufficient as there are no towns, let alone roads or bridges until you take out at Pikiriki. I was set up for that, but it turned out getting to the remote Whakahoro put-in, then from Piki back to Auckland for my plane took more time than I’d allowed myself, once my flights got rescheduled. 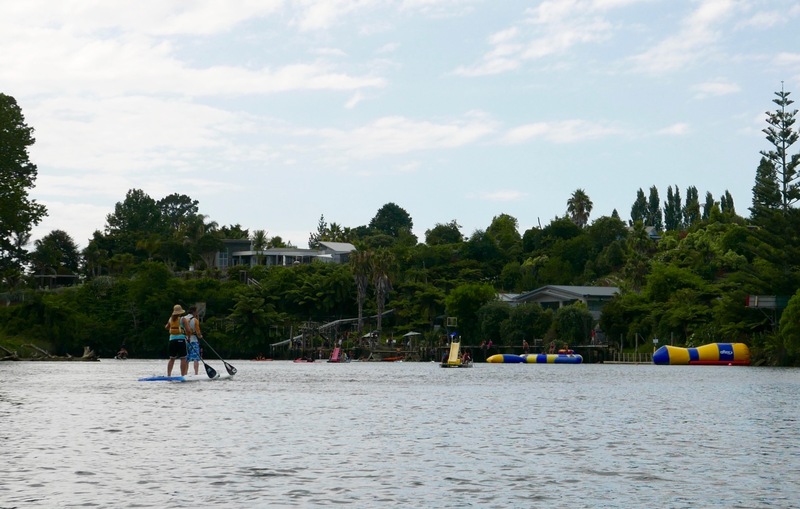 No worries, this in New Zealand: international nexus for outdoor activities. 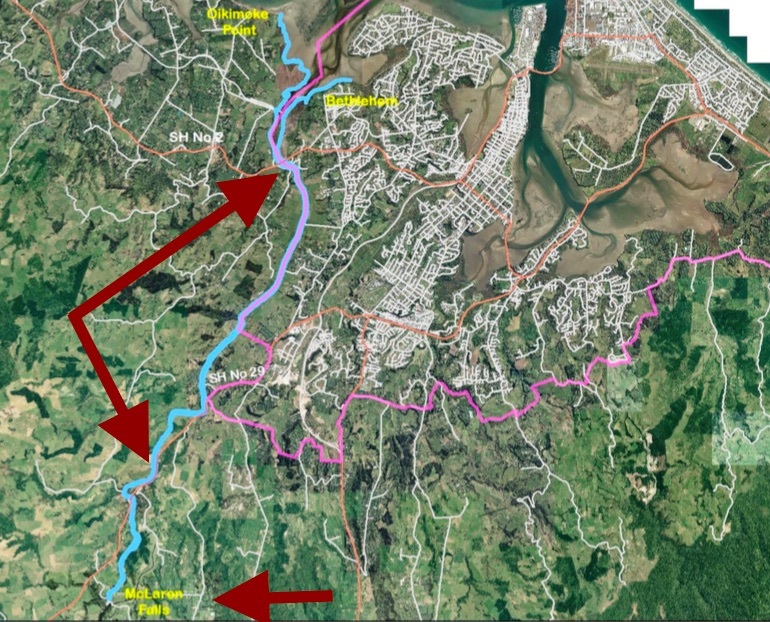 I’d had a bike test arranged at Tauranga on the North Island’s Bay of Plenty, so decided to stick around that region instead of watching days pass by from a bus window. A brochure at the hostel proposed evening kayaking up a glow-worm gorge off Lake McLaren, 20kms south of town. Even in daylight that sounded fun, so I taxied over and planned to walk and paddle back. 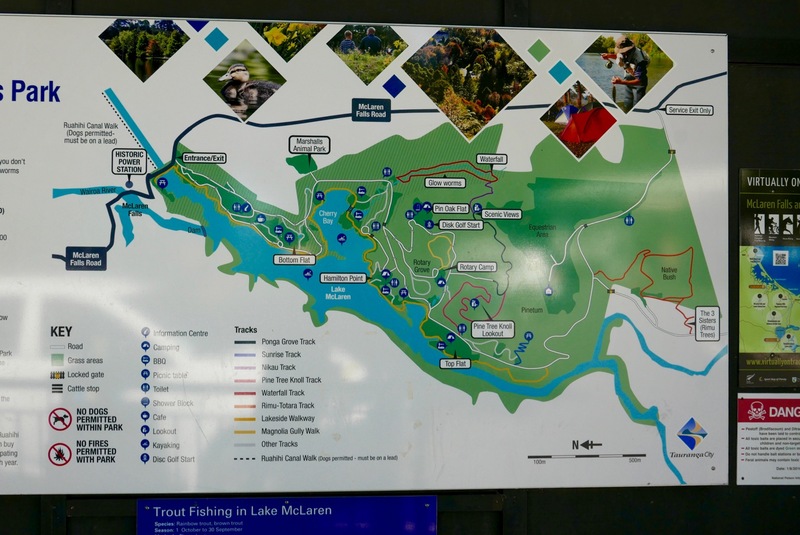 Lake McLaren is a country park (left) with forest trails spread around a small reservoir and an old power station by a waterfall. A good place to reacclimatise myself with the S1 as a quick spin in Sydney a week earlier showed up a crease mid-hull which suggested a slow puncture or just the usual ‘is-it-a-bit-soft?’ neurosis combined with too much fine dining. 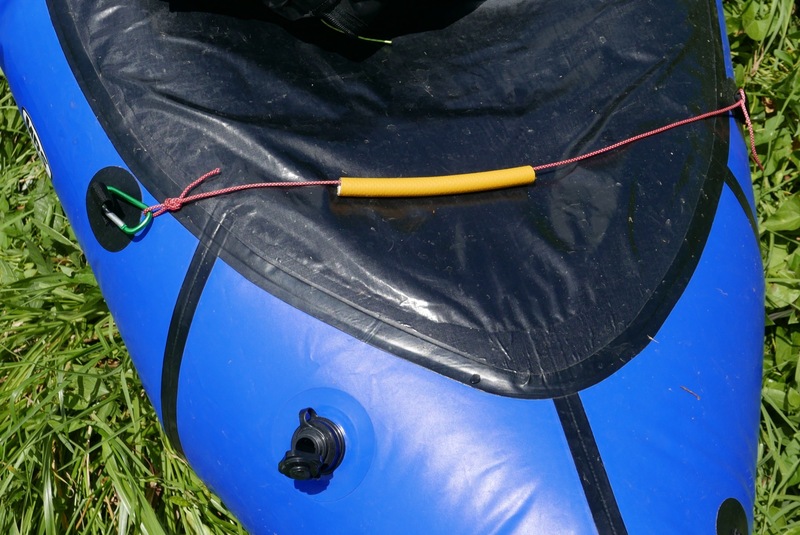 The boat was tempered and inflated to the max with my patented IAT (inflation assist tube; right). 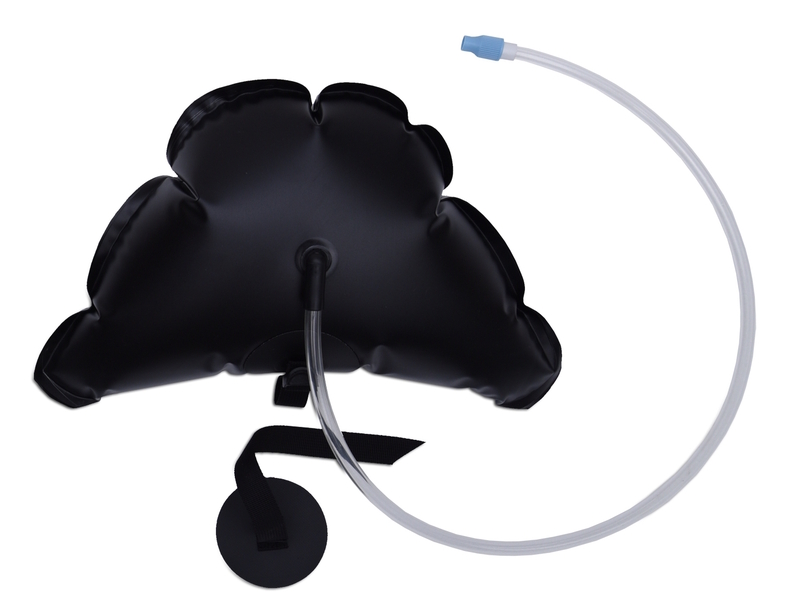 With the yellow hose you’re able to do a much better puff than just with your mouth on the Boston valve. 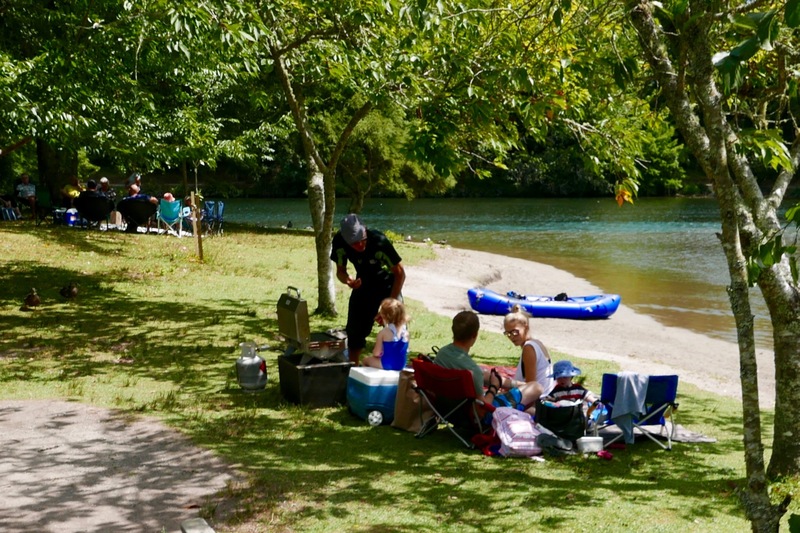 I paddled my way round to the glowworm gorge inlet where families where feeding the ducks and enjoying Waitangi Day picnics. But the gorge stream was barely deep enough to float a duck and my quick foot-recce didn’t go far enough. If there was a paddleable pool up there, it was probably tiny. So I settled for cruising about the lake a bit and force-feeding more air where it wouldn’t go. I didn’t recall any hull creases when I tried the S1 last summer. And I’m sure the seat was suspended off the floor which spreads the load better, rather than pressing on the floor. Anyway, no leaks on this boat. From the park it was a 6km walk back along the main road to rejoin the river at the newer Ruahihi power station. Between the park and Ruahihi I presume the lake’s output gets diverted through pipelines, baring occasional releases for the white water brigade. 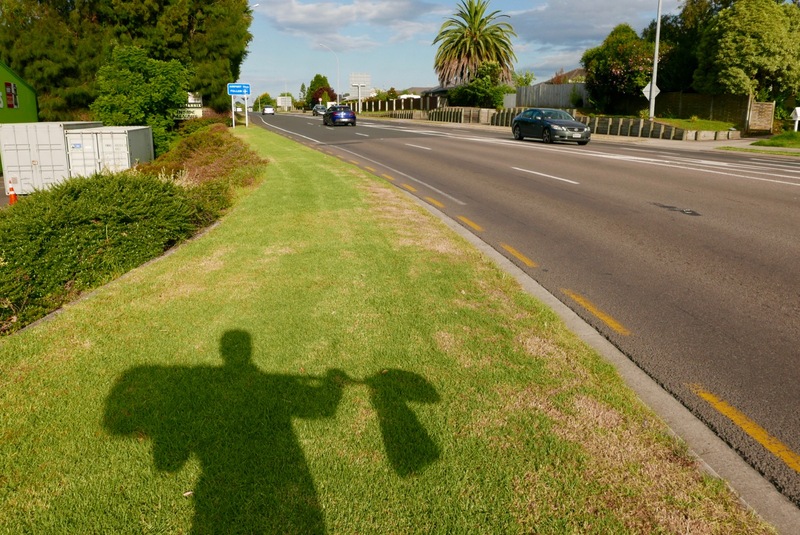 Having appraised the range of Newzealandish roadside detritus, just by the station I slithered down a steep bank thick with flowers and grass (left) and reinflated. 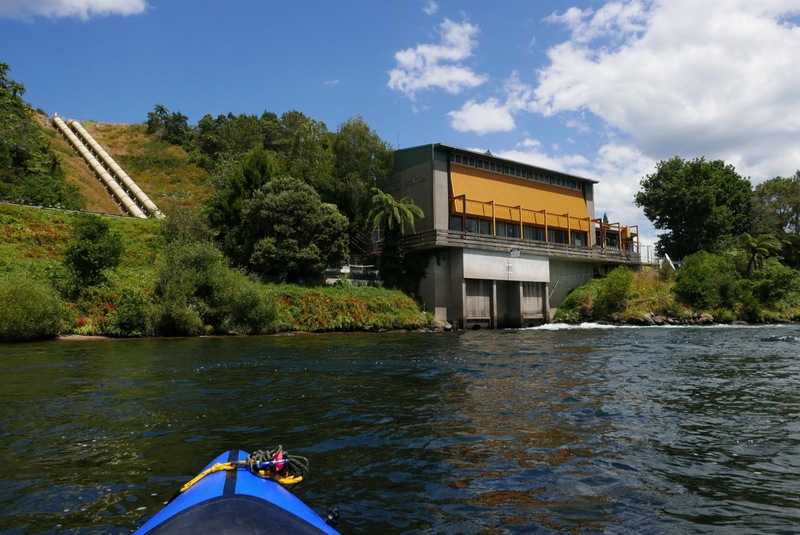 A nice current kicked out of the power station’s bores and I set off for the three-hour or 12km run to a water park by a road bridge west of Tauranga. 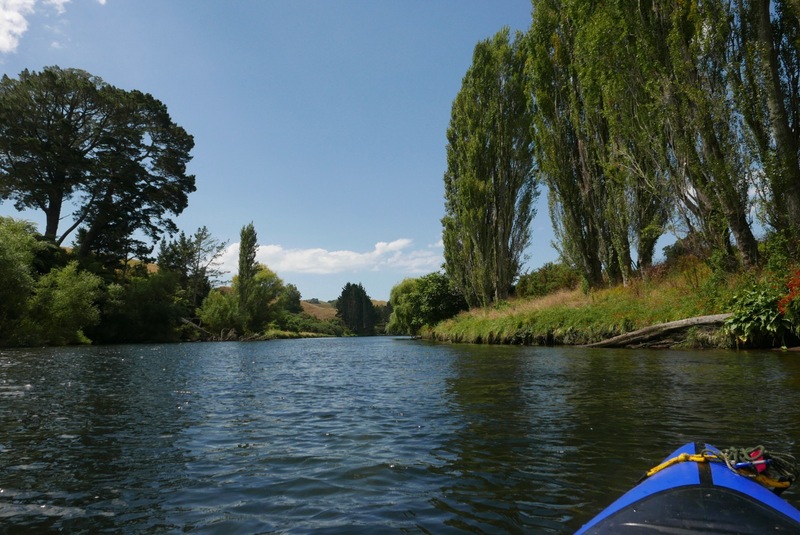 It would be nice to report the Wairoa was a magical paddle. Giant, palm-like fern trees certainly give NZ’s lush, English-looking countryside an other-worldly, Jurassic quality. 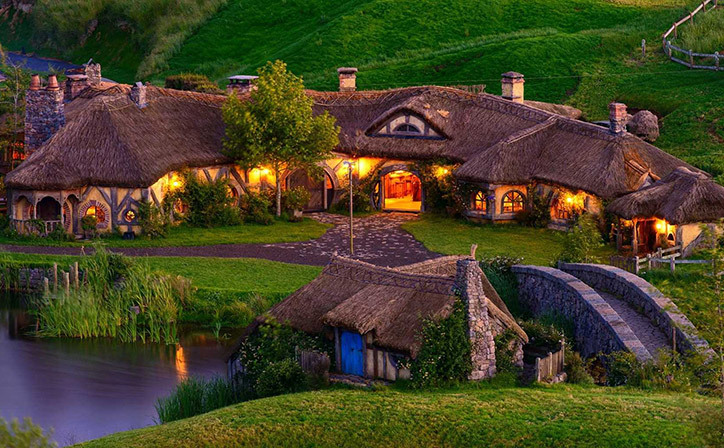 It’s no coincidence that just down the road they’ve renamed a town Hobbiton (right) in honour of the movie filmed there. 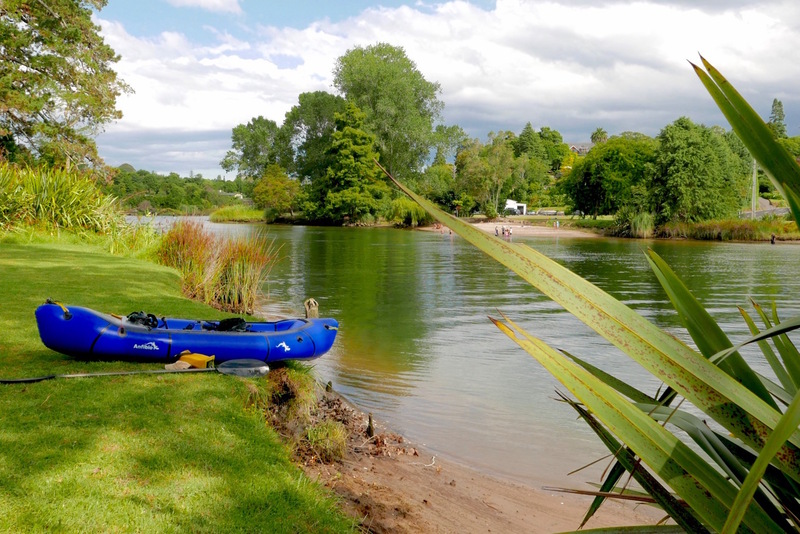 The Wairoa might make a nice afternoon’s flatwater canoeing, but I do miss a bit of easy Massifian eau vivant. 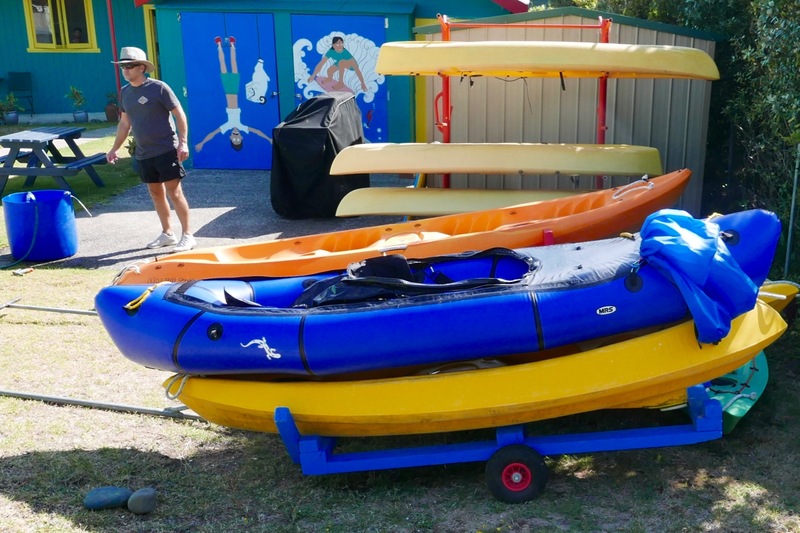 Youtube vids suggested the Whanganui has some rapids fit to tip beginners’ canoe, but here all I got was the cooling breeze which developed into an annoying headwind. 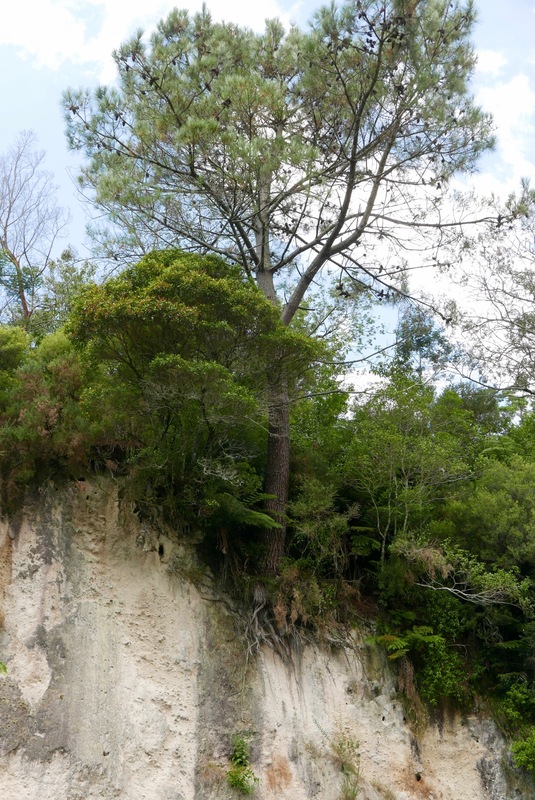 I put my head down and dug away, on the way passing a clifftop tree (left) which surely must be one good deluge away from crashing down into the river. I may have skipped lunch and haven’t padded since the summer, but I was getting more tired than I should be. Something felt off with the seating and bracing set up meaning I wasn’t relaxed. 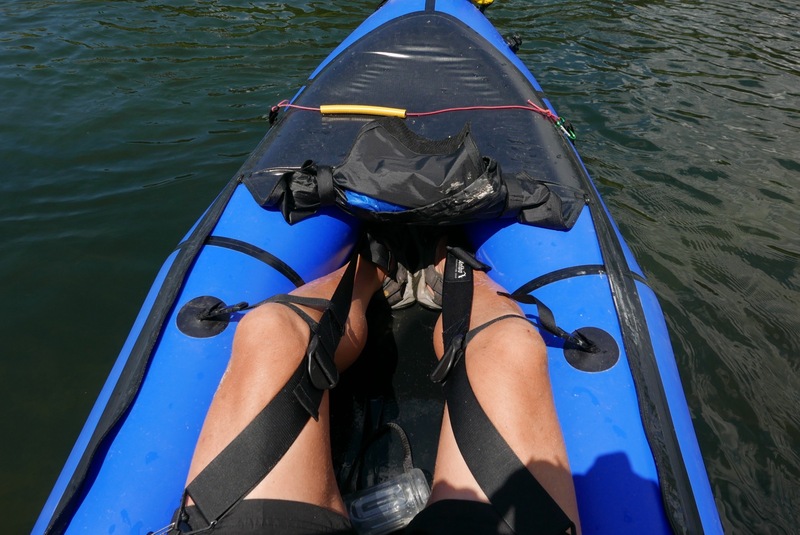 One problem with the mid-seated Nomad (or any packraft much longer than 130cm inside) is that you can’t jam yourself in back-to-foot, leaning on the stern with the feet braced against the bow. The Packrafting Store included Anfibio knee braces which, after some adjustment, improved things a bit, but wasn’t as good as bow-braced feet. I see the Store are now selling an MRS footrest for €30 (right) which shortens the distance by six inches or so. It’s another thing to carry and inflate so before that I may move the seat forward a notch or two (later I did and a footrest is still needed, but the braces can be ditched for non-whitewater gymnastics). ’Oh it’s a few kilometres’. Surely not. I pulled over and, clinging to a moored boat against the wind, fired up the GPS. That’s more like it – not so far at all. 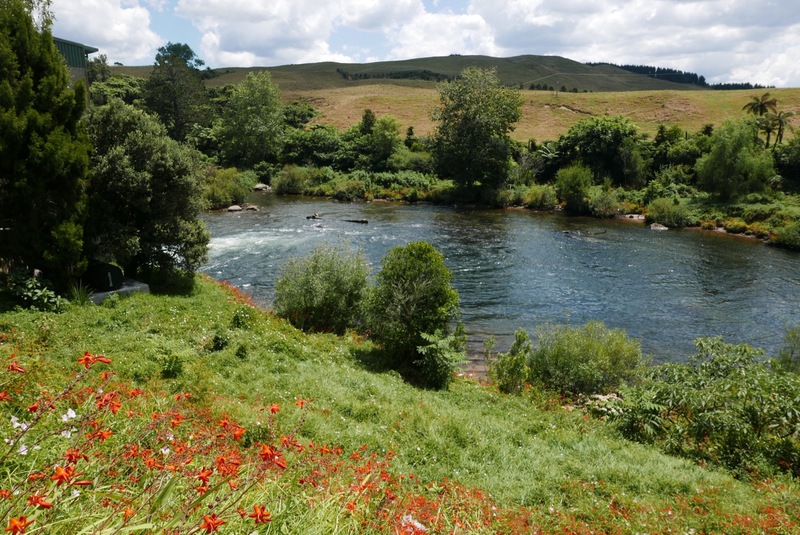 Soon there were kids churning along on pedallo-powered water slides, SoTs, giant inflatable silliness and a water chute hurling screaming infants into the river. What better way to spend Waitangi Day. Beyond, traffic rumbled over the road bridge and before that, a steep tidal bank lead up to a nicely mowed lawn for a dry off during a bit of a lie down. One-fifty minutes for 12 clicks – not so bad considering it felt like dog water much of the way. From here it was a 7-km hike through Tauranga’s affluent suburbs back to the hostel. On the way a supermarket called me like a siren: ‘Food… large amounts’. Once out, I’d didn’t even re-park my trundler, as trolleys are called here, before gorging myself on a pain-au-choc, peaches and yoghurts. The rest of the shopping for the evening meal nicely balanced my paddle for the long walk back. 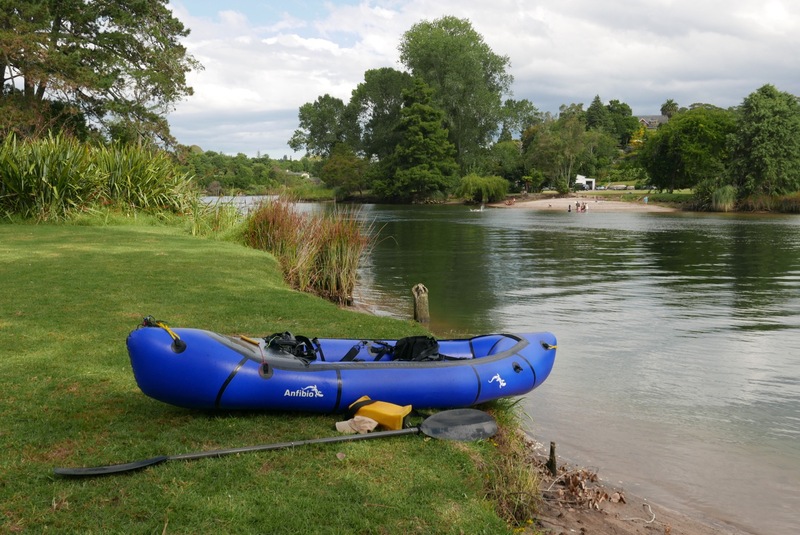 This entry was posted in MRS Nomad S1, Packrafting, Travel Reports and tagged knee braces, Lake McLaren, MRS Nomad S1, New Zealand, packyak, Tauranga, Wairoa River, Whanganui River. Bookmark the permalink.